On my recent trip to Maui I experienced what to me was an experience of a lifetime. Seeing green sea turtles (honu) up close. 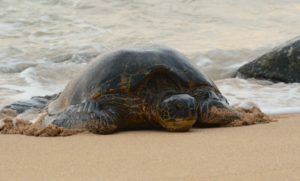 Hawai’i and Australia are the only two places in the world where sea turtles come on shore for reasons other than nesting. They come on shore to rest. I connect deeply with sea turtles and observed this behavior for quite some time. Like a gift from the ocean I would watch them one (or sometimes two!) at a time crawl out of the ocean. They would let the waves bring their massive bodies on land, expending as little energy as possible. Once at the shoreline it would sometimes take up to 15 minutes before they would inch their way up on the beach and even then they would only come up the beach 5-10 feet. They got me thinking about you. Sea turtles are autonomous. They wait for no one to give them permission to take care of themselves. Because they need to, to survive. How about you? What do you need? What do you need to give yourself permission to do? Take a day off? Take an hour off? Walk in the woods? Go to the dentist? Rest? Eat a healthy meal? Receive love? Say no? Say yes? I want to ask you that in the next 24 hrs you do something to honor yourself. It can take 5 minutes or 5 hours, you get to decide. Not that you need it but you have it. Stop waiting for appreciation from others, it comes from within. It comes from you. Appreciate yourself. I bow to you and all that you do for others. I know how hard you care and the toll it can take. That’s exactly why I’m asking you to do this for yourself.